I have too much resin. So I did not select any. I use them as stackers more often than passages. I still have the helping hands insert. The resin 4 way intersection are also good stackers. The kids used the helping hands so much I made a dedicated set.Lady Sabelle Designs Silicone Molds made the hands. I do not have any of the PVC sets. The new design is nice. I set up a challenge for myself last night: make the largest passages build possible with the pieces I have in each set, freehand, no pre-planning. I built first with DoDP and then replicated it in OGP. once again inner corners are the weak link in my build. I can see why the Doomroller encounter comes with a large ratio of inner corners relative to outer corners. The only reason I can think of for why the DoD "Passages - Walls" comes in a 1:1 ratio is that they share a mold and it's only cost effective this way. Which is too bad since I rarely need outer corners in my builds. I've gotten faster building with DoDP and can more quickly assemble a small section in my hand and place it vs putting down a floor and awkwardly assembling around it as I was doing before. The storage difference between DoDP and OGP is pretty significant. I think, from a volume perspective, it's close to 2:1, DoDP:OGP, even taking into account the floors. Which reinforces the previously mentioned point about needing a ton of floors! If I do order more DoDP, I'll have to give some thought to potentially ordering more floors. DoDP has the awesome advantage of allowing trapped floors and walls in a passageway. OGP retains the advantage of build speed, although that has diminished somewhat with practice. Pro Tip - You can avoid running out of 1" Passage Walls in intersections in many cases by virtually "sliding" the 1" gap to join with a corresponding 1" gap further down and just use a 2" passage wall. You can see where I did this in the DoDP Max Build picture below, top horizontal passage, south wall only uses 2" passage walls compared to the other walls that each use two 1" passage walls. Ok, I'll shut up now and get to the photos before a raging lagomorph scolds me for being verbose. Leftover pieces shown in each photo. I had a significant amount of DoDP Outer Corners and OGP Double Bevel sections left over. I'm slowly coming to the realization that these pieces are my most cherished in DoD. Their versatility for creating never-before-possible room configurations is staggering. Did you get enough inside corners? I feel like I'm short on those, at least for complex intersections. 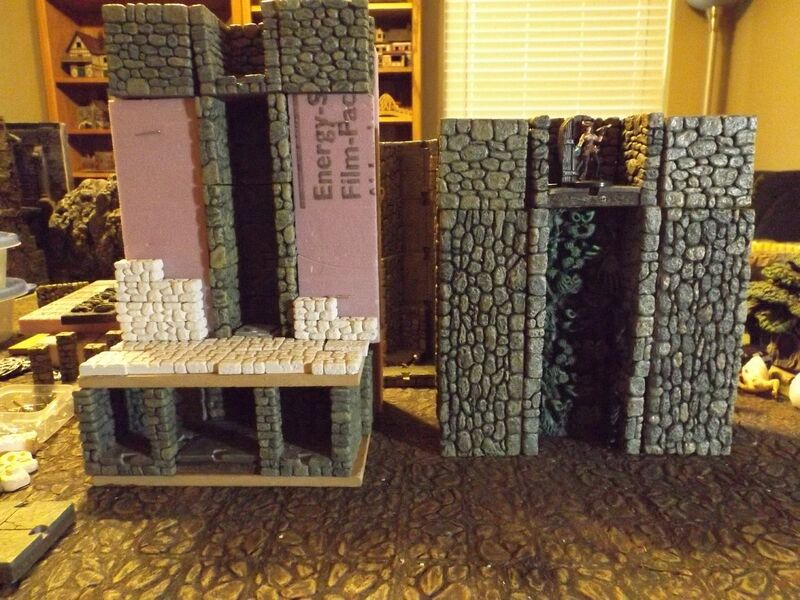 This is how many came with the Passages - Walls add-on set. I haven't tried to do anything too complicated but feel it's enough (mixed with my resin passages) to get me by. For me, though, their real utility is creating true 10ft sections, alcoves, niches, etc. Here's my attempt to build with primarily OGP, including just enough DoDP to allow for my southern passage to be 3 tiles tall (I'm assuming I want this for some reason - it was an accident on my original DoDP build) and to allow for a magnetic wall trap. It was going great until I got to the corners with the magnetic wall trap, where the beveled edges became a problem. I dropped in a few 1" DoDP passage walls to fill the gaps and it looks...ok, but not great. A nice comparison indeed. I got none of the original and only some of the new passages. I like the new passages more than I thought I would but the problem of throwing off the grid is a real one for me. 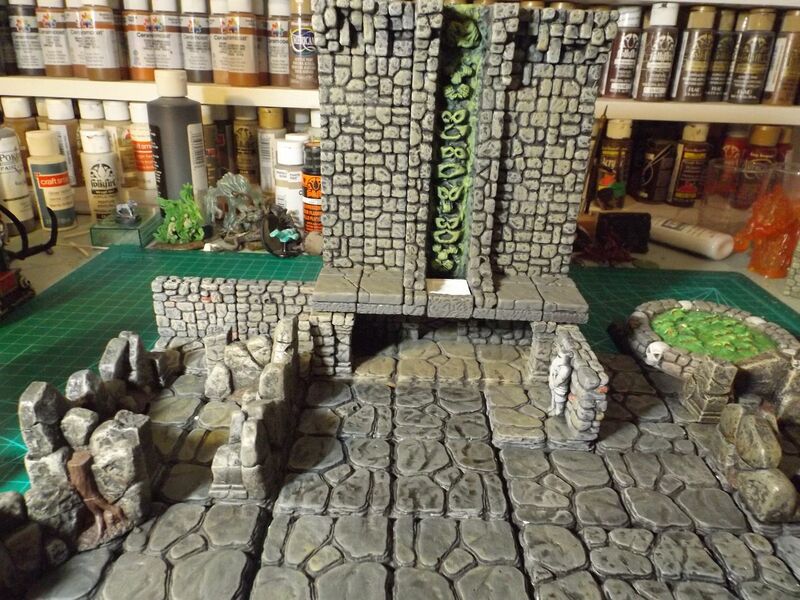 They do line up in odd ways sometimes though when I used the dungeon 1x1 corners and wall pieces. . 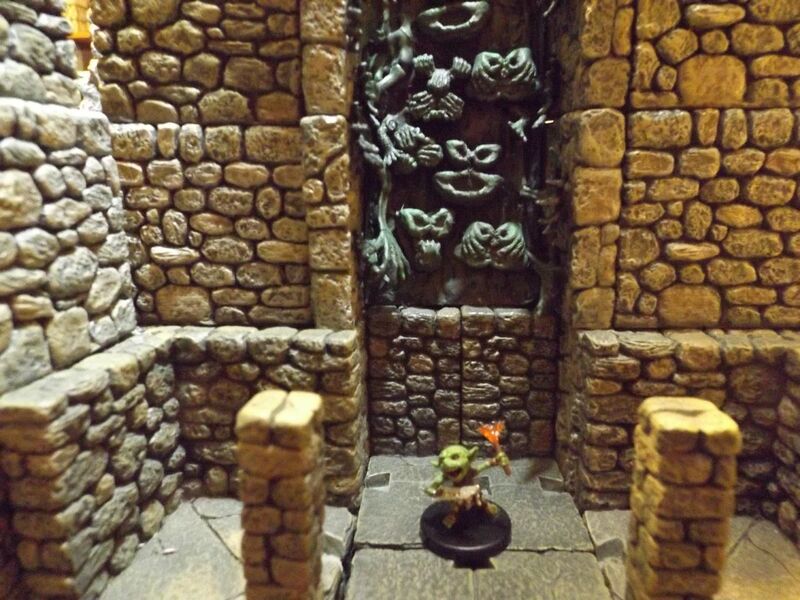 I finally got some time to get back to inventorying and organizing my KS5 pieces and played around with the new Dungeon of Doom (DoDP) passages and compared to the original dungeon passages (OGP). I was slightly skeptical of the DoDP during the Kickstarter and only went in for one Passage Walls pack (plus misc. stuff from a few encounters), but see clear utility now that I've played with them in person. I also tried mixing the two styles...this was easier in the hallways and nearly impossible in the intersections / corners. I think it's worth having both styles and need to experiment more to decide where to use each. I also discovered that terrain trays are great for small builds and photo shoots since I can setup in one area and move over to better lighting for the photo. This works great even for OGP that doesn't have magnets. I suspect that in the long run I'll add magnets to my older tiles (at least Caverns and OGP...KS1 tiles are so shallow that I may not bother). And, this is the photos section of the forum, so here are the pictures I took! More to come.